Looking for a delicious, hearty and warming slow cooker meal? 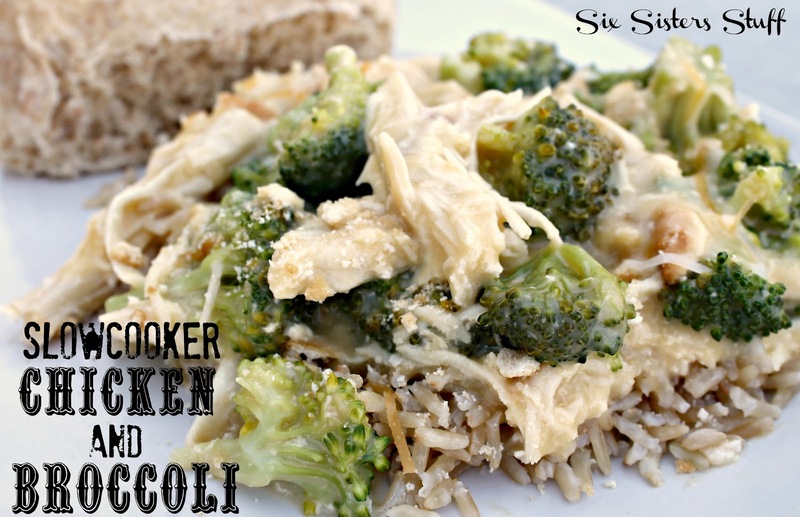 This crock pot meal is so fast to throw together and tastes delicious! It tastes a lot like my Mom’s Chicken Divan… just a lot easier. Put everything in except sour cream, broccoli. and rice in the crock pot. Cook on low for 6 hours or on high for 4. Shred the chicken breasts with two forks. In a rice cooker (or however you like), cook the rice. Meanwhile, add broccoli to the crock pot and stir in. Cook for another 30 minutes. Stir in sour cream with the crock pot mixture. Enjoy over a bowl of rice. I love the sound of the recipe but I think I am missing something. You have in the directions to put everything in the slow cooker except sour cream, etc. I do not see sour cream in the ingredients. How much do I need? Thanks! Oh man! Sorry about that! I fixed it for you! Thanks for pointing this out, Kristy! I noticed this, too. Also, I think it is safe to assume that it is "garlic" salt, not "galic". The vast majority of the meat my family eats is boneless, skinless chicken breast meat, and I LOVE broccoli, so I can't wait to give this a try! I am on a gluten-free diet and would probably substitute cream of chicken for GF cream of mushroom. What about cream of cheese, not sure I can find a GF substitute. Do you have suggestions? So I have been searching for you...but you could even try 1/2 cup shredded cheddar cheese and 1/2 cup GF cream of mushroom soup. Sorry I don't have any more solutions! Hope this helps! Can we use frozen chicken breast? and is the broccoli pre-cooked? 30 min doesn't seem long enough for a raw vetgetable! Thank you. I actually used frozen chicken breasts and it worked just fine. I also used raw broccoli and thought the same thing you did. But believe it or not... it was cooked rather well. Not too hard and not mushy! Thanks for your question! Broccoli is the one vegetable that cooks rather quickly and you don't want to overcook because, as you said, it can get mushy, and to be honest not too tasty. So this makes total sense. Plan to give it a try because all of the ingredients are favourites in my family. If I use frozen broccoli when should I add to crock pot? Made this tonight, and it is awesome! :) I don't usually like broccoli, but this makes it taste really good. I just realized you got this recipe from me and that makes me so happy. I'm making this again for dinner tonight and so excited to eat it. Thanks for sharing too. I made this tonight and we LOVE it.... as in, my son ate it all and then asked for SECONDS! That never happens. Thanks ladies! This is in my crock pot right now! Thanks for another great recipe! I had the same issue with the cream of cheese soup. Couldn't find it at the commissary, so I settled for regular old cheese soup. I'm making this on Saturday and I can't wait to see how it turns out! I love broccoli and cheese and rice and chicken, and so does my husband, so I can't see anything but good reviews. Thanks! Hi! Love the sounds of this recipe! I am wondering if you have ever frozen this meal? I think it would be good to separate and freeze in containers and have for dinners. Thanks! Hi Chelsea, we have not frozen this meal but the chicken broccoli part should freeze just fine. Not quite so sure about how well the rice would freeze though. Hope this helps!